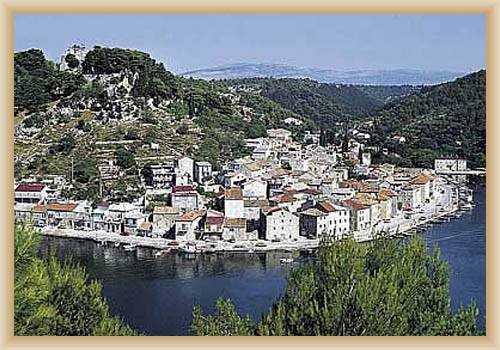 Novigrad, a village and port on the southern coast of the Novigrad Sea, next to the submerged mouth of the Draga brook. Chief occupations are farming, viticulture, fishing and tourism. There is a public pebble beach with a small wood. Novigrad is located on a local road, branching off from road of the main. Novigrad was first mentioned as a castrum at the beginning of the 13th century. On a hill above the village is a fortress from the 13th century, built by the counts Gusic-KurjakovicThe fortification system has been partly preserved. Fragments of stone tablets with "pleter" (interlacery ornaments) have been preserved in the pre-Romanesque graveyard church. Novigradsko Sea is connecting through channel Velebit the straits Novsko zdrilo and with Karinsky sea the straits Karinsko zdrlo. Because the salt and sweat water are mixing here is in the sea lot of fishes and oysters.